CRAZY DISCOUNT! Was: $199.95 Now: $79.88! Make an exclusive place for your lovely cats to enjoy their private playtime with the 90CM Cat Scratching Post Barrel Pet Tower Climbing Frame - Light Grey. This plush and sisal covered cat scratching barrel has 3 connective levels with 2 holes between different levels, a terrific place for cats to hide, play and drill up and down. The high quality woven sisal surface makes this cat tower a perfect toy for conditioning their claws, so never need to worry that they will scratch your luxurious sofa or any other furniture. 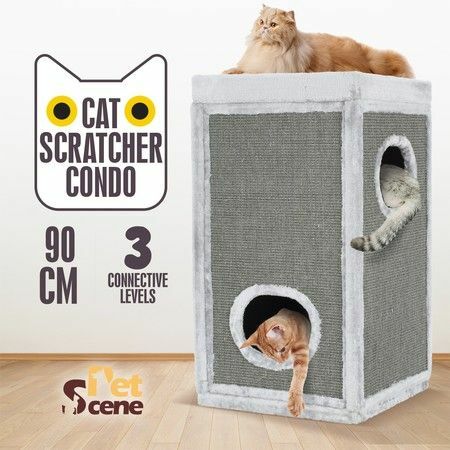 The cat scratching pole features a sturdy construction, which ensures safety while cats are playing with it to fully stretch their back and shoulder muscles. Let your lovely little creatures enjoy the entertainment with this cat condo!